It ensures pesticides such as glyphosate perform as intended by tying up hard water minerals. It lowers the pH of your solution to 5 so it is readily absorbed into plant leaves. Alternatives may provide one benefit or the other, but few do both. The problem is tap water often contains levels of magnesium, calcium, and iron, which can increase the pH of the water in your solution to over 7. Calcium ties up glyphosate, and an elevated pH inhibits absorption. SOIL BOOST PLUS contains some AMS and a pH-lowering ester to drop the pH of your water to about 5. Adding just 1 pint per acre controls the pH, eliminating the need for a pH tester. 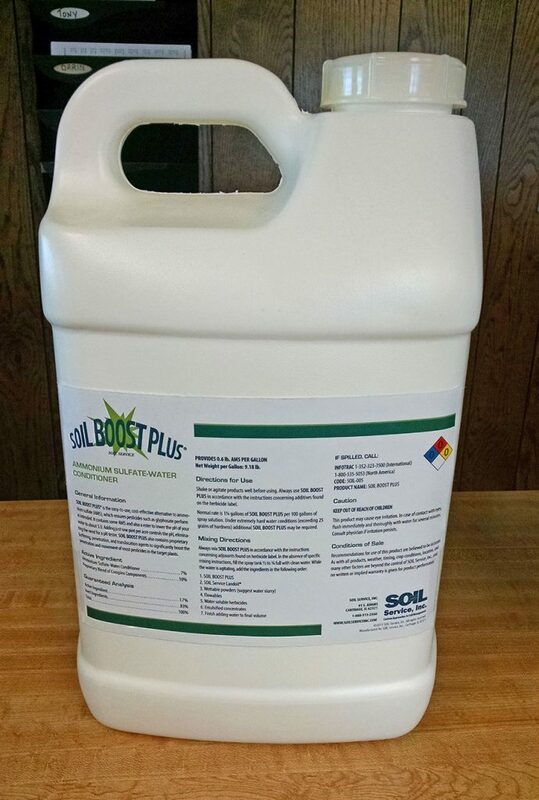 SOIL BOOST PLUS also contains proprietary buffering, penetration, and translocation agents to significantly boost the penetration and movement of most pesticides in the target plants. SOIL BOOST PLUS is proven to work. A study at Southern Illinois University tested SOIL BOOST PLUS and three other liquid AMS replacement products. Researchers artificially hardened the water to 250 grains of hardness, then tested a low rate of glyphosate alone. They also tested the performance of glyphosate with SOIL BOOST PLUS as well as glyphosate with the three competitive products. SOIL BOOST PLUS at 1 pint per acre controlled both water hemp and common ragweed significantly better than all the other products.